Alexander Osterwalder is an expert on business model innovation. Here's what he has to say about your current business model -- and why it's not working. Alexander Osterwalder knows what your business needs: A new business model. So he created a tool to help you map it out, the Business Model Canvas. The entrepreneur also co-authored Business Model Generation, a book about business model innovation that has become a global bestseller. Inc.’s Caitlin Berens talks with Osterwalder about why you should think twice about your business model and how to develop it for growth. Why is it important to rethink your business model? As an entrepreneur if you want to find a way to grow and to keep ahead of others you better think of the business model and not just your products and technology, like most entrepreneurs. The smartest people are focusing on products and the business model, it’s a combination of both, it’s not either-or, it’s and. The iPhone is a good example of this, it’s not just the technology Apple has, but also their business model that utilizes a double-sided market, developers, and hundreds of thousands of apps. Where do many business models go wrong? Too often entrepreneurs fall in love with their first business model, which is often a very simple one, make and sell. Making the wrong business model choices can put you into a niche rather than putting you into a multi-million dollar business. You can’t just depend on the product—even a great product with a poor business model can still lead a business to bankruptcy. So how can you develop a business model for growth? First, burn your business plan. Business plans are static documents where you describe an idea. We’re moving now toward a different way of thinking which is designing and testing business models. A business model is a dynamic model that you will change according to what you learn from the market until you figure out which model is best. So focus on the design of your business model; think through five to 20 different ones, make hypotheses, and then get out of the building and test them before you settle on one; just having something good on paper isn’t enough. If your assumptions were wrong, change your business model and retest it until you have a feeling that something could work, then start investing. Accept that you need to fail a lot and you need to fail quickly. These little experiments will help you actually validate or invalidate your hypotheses, rather than wasting a lot of time and money. But what if your co-founder or team is against the change? Here’s the thing: Opinions don’t matter; people have opinions, “this is good, this is bad,” but what you really want to have is information from the market. It doesn’t matter what your co-founder thinks, it doesn’t matter what you think, it doesn’t even matter what your VC thinks; the only thing that really matters is what the market thinks. Get market data because the market is the ultimate judge. We’re moving away from opinion-based entrepreneurship toward more fact-based entrepreneurship where we have hypotheses that we test for feedback on what works and what doesn’t. Why did you create the Business Model Canvas? We’re only starting to learn how to really address this business model issue systematically, because “business model” is a word that everybody uses and nobody really understands it because it’s a buzzword. So I created the Business Model Canvas to help people visualize business models, discuss them, and ultimately invent better ones. What makes it so successful? Describe it to me. 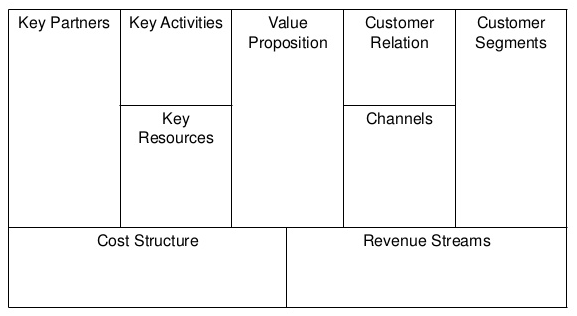 The Business Model Canvas is an approach that allows entrepreneurs to describe, challenge, and invent business models. At the very basic level people will use it as a checklist, so you write down and describe all of the components that are necessary to your business, like a strategic blueprint. This gives you a holistic view of what your business needs. It also helps you visualize other business model alternatives. The Business Model Canvas has been downloaded in the millions. People needed something to help them better discuss and visualize business models.